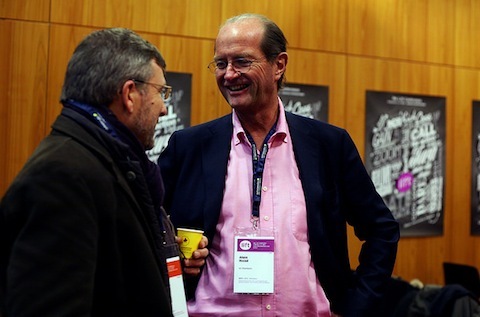 Lift has launched a new format for busy Executives at Lift 14. In partnership with Accenture, we have created the « Lift Exectuvies Briefing » a breakfast meeting on the first day of Lift, where we presented a preview on key innovation and technology insights. The objective was to offer a condensed preview of of the hot topics of Lift14, that will have an impact on business strategies. Sylvie from Lift explored opportunities related to futures of work, new business models for new modes of ownership and control, as well as futures of retail and relationship economies. Bracken Darrell, CEO and president of Logitech, shared his thoughts on innovation and the role of design implementing change in large companies. Estelle Metayer, founder of Competia, board member at Ubisoft and Lift editorial board member highlightend the importance of weak signals informing business strategies and gave personal recommendations on how to explore and study these with the help of Lift conference. Over 30 executives from multinationals, SME’s, NGO and government agencies were present at this first edition and exchanged ideas in a stimulating and informal enviornment. After the talks they were given guided tours of the interactive design exhibition and the start-up lounge. Some left after the briefing to go back to work and many stayed throughout the day to hear more about the trends presented. This first Lift executive briefing got enthousiastic feedback and while we will be looking to improve the experience, we will most certainly do a second edition!